This guide covers viewing and collecting information from your clusters, hosts, virtual machines, resource pools, datastores, and repositories in Red Hat CloudForms. Clusters provide high availability and load balancing for a group of hosts. The Clusters page under Compute → Infrastructure displays the clusters discovered in your enterprise environment. Navigate to Compute → Infrastructure → Clusters. Red Hat CloudForms provides features to compare properties of clusters. Click (Configuration), and then (Compare selected Clusters). The comparison displays in a default expanded view and lists a limited set of properties. Click (Monitoring), and then (Utilization) or from the accordion menu, click Properties → Capacity & Utilization. Click (Monitoring), and then (Timelines) or from the accordion menu, click Properties → Timelines. The Hosts page under Compute → Infrastructure displays the hosts discovered in your enterprise environment. Navigate to Compute → Infrastructure → Hosts. Red Hat CloudForms allows you to compare hosts and check operating systems, host software and version information, and hardware. The following descriptions pertain to the Expanded View . Either the value of a property or an icon representing the property displays depending on the properties type. If you are in the Compressed View , the values of the properties do not display. All items are described by the icons shown below. When a host is refreshed and a new virtual machine is discovered on that host, Red Hat CloudForms checks to see if the virtual machine is already registered with another host. 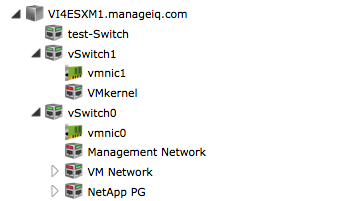 If this is the case, the host that the virtual machine is associated with switches to the new host. If the SmartProxy is monitoring a provider, this happens automatically. If not, the next refresh of the host addresses this. If not using a provider, use Red Hat CloudForms’s Discovery to find hosts in your environment within a range of IP addresses. Red Hat CloudForms searches for the supported hosts. When available, the new hosts display. They are named by hostname and IP address. To make them identifiable, edit the basic information for each host. Host Summary: Use the Host Summary to see the properties of a host, drill down to a hosts information, and, view its installed virtual machines. To categorize hosts together, apply tags to multiple hosts at the same time. Check the hosts to tag. If a host is decommissioned or requires troubleshooting, it might require removal from the VMDB. Check the hosts to remove. Click (Configuration), and then (Remove items from the VMDB). The hosts are removed. The virtual machines remain in the VMDB, but are no longer associated with their respective hosts. Through Red Hat CloudForms, you can perform a Compute scale down on a Red Hat OpenStack infrastructure provider. This process involves decreasing its Compute nodes used by an OpenStack infrastructure provider. Doing so involves putting a Compute node into maintenance mode and removing it from the provider afterwards. Once a node is in maintenance mode, it can be repurposed (for examle, re-provision it as a Controller node), repaired, or decommissioned altogether. Before scaling down, evacuate or migrate any instances hosted on the node you are removing. For instructions on either procedure, see Section 12.19, “Migrating a Live Instance” or Section 12.20, “Evacuating an Instance”. Click the OpenStack compute node to be removed from the provider. Click (Configuration), and then (Toggle Maintenance Mode). This option can only be used with OpenStack providers with at least two Compute nodes. Repeat this procedure for every node you want to remove from the cloud provider. Click the provider to be scaled down. Click (Configuration), and then (Scale Down). From the Scale Infrastructure Provider Down section, check the nodes to be removed from the provider. You can only do this for nodes where Maintenance is set to true. Refresh the relationships and power states of the items associated with your hosts from the Host Taskbar. Click on the host to refresh. Click (Configuration), and then (Refresh Relationships and Power States) on the Host Taskbar. Red Hat CloudForms determines the state (running, stopped, or paused) of all virtual machines registered to the host. View Capacity & Utilization data for hosts that are part of a cluster. Your Red Hat CloudForms server requires network visibility to the provider assigned the Server Role of Capacity & Utilization Collector to enable this feature. Click the Host to view capacity data. Click (Monitoring), and then (Utilization) or from the Host accordion, click Properties → Capacity & Utilization. 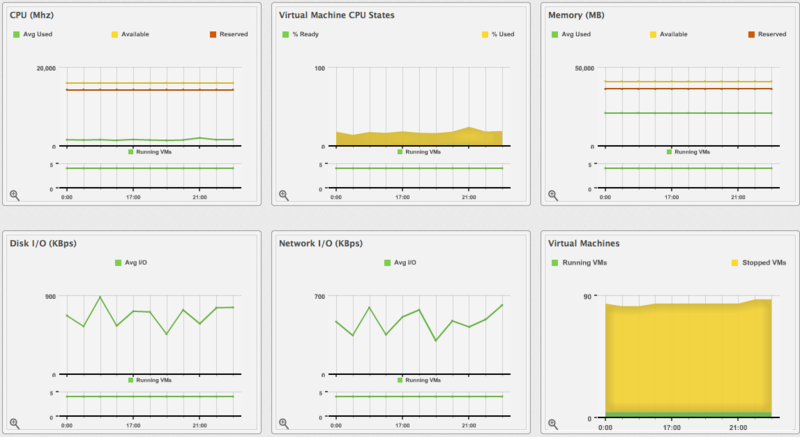 The charts are displayed for CPU, memory, disk, network, and running virtual machines. 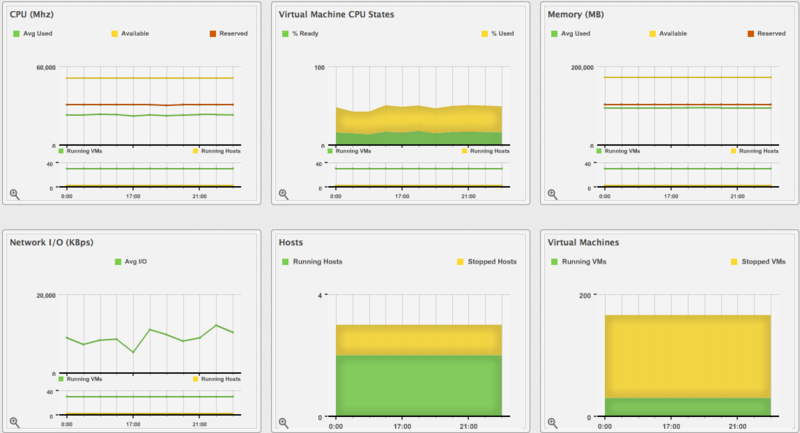 View the timeline of events for the virtual machines registered to a host. Click the Host to view the timeline. Click (Monitoring), and then (Timelines) or from the Host Accordion, click Properties → Timelines. From Options, customize the period of time to display and the types of events to see. Use Show to select types of events to show on the timeline. Use Date to type the date the timeline displays. If you select to view a daily timeline, use Show to set how many days back to go. The maximum history is 31 days. If selecting Hourly, select the interval to see. From the Level dropdown, select either a Summary event or a Detail list of events. For example, the detail level of a Power On event might include the power on request, the starting event, and the actual Power On event. If you select Summary, only the Power On event appears in the timeline. The three Event Group dropdowns allow selection of different groups of events to display. Each group has its own color. Clicking on a specific host shows the Host’s Virtual Thumbnail and an operating system-sensitive screen of host information, called the Host Summary. Where applicable, click on a subcategory of the Host Summary to see more detail on that section. A Refresh provides some basic information on the Host. To get more detail, enter credentials for the host and perform a SmartState Analysis. The Summary divides into the following categories. Properties include information such as base operating system, hostname, IP addresses, devices attached to the system, and storage adapters. Some categories can be clicked on for additional detail. For example, click Network to view the network adapters connected to the host. Relationships include information on the provider, cluster, datastores, resource pools, and installed virtual machines. Security shows the number of users, groups, patches installed, and firewall rules on the host. Click on any of these items to see further details. Run a SmartState Analysis on the host to retrieve this information. Storage Relationships shows the relationship the host has to LUNs, volumes, and file shares. The Storage Inventory Role must be enabled in the zone for these items to be populated. Configuration shows the number of packages and services installed. Click on any of these items to see more details. 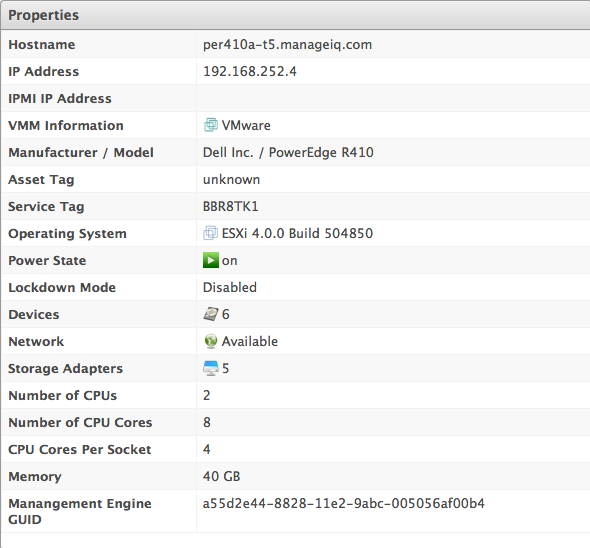 Smart Management shows all tags assigned to this host. Authentication Status shows all the types of credentials entered for this host and the whether those credentials are valid. Access information on the hardware devices including processor, CPU type and speed, and memory for each host. Click the host to view the network information. From the Host Accordion, click Properties → Devices. Access information on networking including switches, network interfaces, and local area networks for each host. From the Host Accordion, click Properties → Network. Access information on the storage adapters including storage type for each host. From the Host Accordion, click Properties → Storage Adapters. See the difference between the last known state of a host and its current state. Review the configuration changes that happen to a particular host between multiple points in time. Capture the configuration drifts for a single host across a time period. Click on the host to view drift. Click Relationships in the Host Accordion. Click (Drift) at the top of the screen. The results display. A (Changed from previous) shows a change since the last analysis. A (Same as previous) means no change since the last analysis. Click (Remove from drift) at the bottom of a column to remove a specific analysis. The drift recalculates and the new results display. Click (Expanded View) to see the expanded view. Click (Compressed View) to compress the information. The drift comparison displays. Download the data or create a report from your drift for analysis using external tools. Use the drift report feature to export information about your host’s drift. Type in a name for the search expression in Save this VM search as. (Note that this title depends on the type of resource you are searching.) To set the filter to show globally, check Global Filter. The filter is saved and will show in the My Filters area of the Filter accordion. If you checked Global Filter, the filter will show there. While you can set the default view for different pages in Settings → My Settings → Default Views, the current view can also be controlled from the Virtual Machines pages. The Set Server Relationship option enables the VM SmartState Analysis job to determine the datacenter where a Red Hat CloudForms appliance is running and thus to identify what storage it has access to in a Red Hat Enterprise Virtualization environment. Click Configuration → Edit Server Relationship. Click (Configuration), and then (Compare Selected). The comparison displays in a compressed view with a limited set of properties listed. To delete an item from the comparison, click (Remove this from the comparison) at the bottom of the items column. This option is only available when comparing more than two virtual machines. 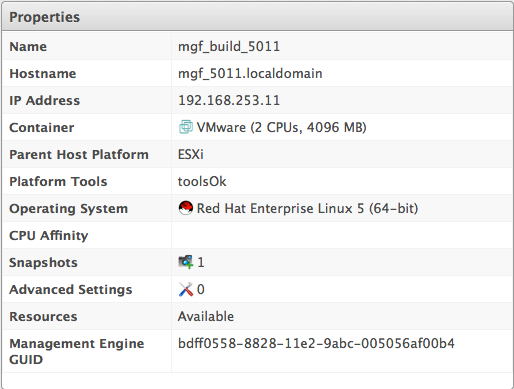 Red Hat CloudForms can collect processes running on Windows virtual machines. To do this, enter domain credentials for the zone where the virtual machine is located. For more information, see General Configuration. The virtual machine must be running and must have an IP address in the VMDB, usually obtained from a SmartState Analysis. Click (Configuration), and then (Edit this VM or Edit this Template) on the Taskbar. 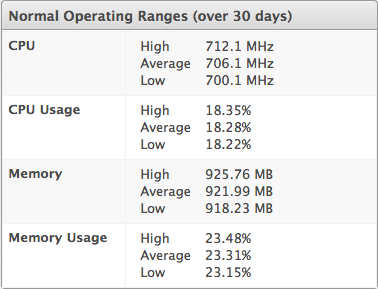 Normal Operating Ranges shows the values the normal operating range for this virtual machine. These statistics are used in calculating right sizing recommendations. Before opening a console for a virtual machine, you must first configure console access at a network layer, and then configure the browser plug-in and certificate for the virtual machine console. This section only applies to using the VMware MKS or VMware VMRC browser plug-ins for accessing a virtual machine console. It does not apply to access through the HTML5 console. To use a browser plug-in for accessing a virtual machine console, you must have installed VNC on the machine on which you access the Red Hat CloudForms Console and installed either the VMware MKS plug-in or the VMware VMRC plug-in in your browser. Navigate to Settings → Configuration. Click the zone where the Red Hat CloudForms server is located. Replace console with the browser plug-in that you have set up. Valid values are mks and vmrc. Click (Open a web-based VNC or SPICE console for this VM). Resource pools are used to allocate CPU and memory across a group of virtual machines. If a resource pool is decommissioned or requires troubleshooting, it might require removal from the VMDB. Navigate to Compute → Infrastructure → Resource Pools. Click on the resource pool to remove. Click (Configuration), and then (Remove from the VMDB). The resource pool is removed. 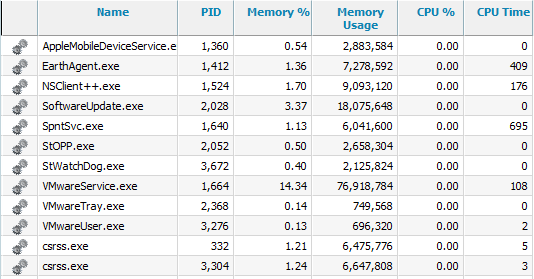 The virtual machines remain in the VMDB, but are no longer associated with this resource pool. Use tags to categorize a resource pool. Click the resource pool to tag. 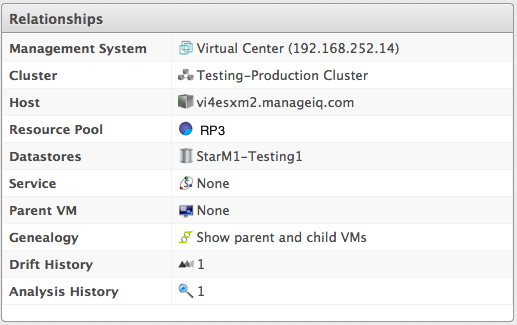 Use the Resource Pool Summary to see the number of discovered virtual machines, the parent host, and the parent cluster. It is the default view when you click on one resource pool. Use the Resource Pools Accordion to access the properties of and objects associated with the resource pool. Click Properties to view the Resource Pools Summary screen. Click Relationships to see the clusters, virtual machines, and hosts related to this resource pool. A storage location is considered a device where digital information resides and is connected to a resource. Red Hat CloudForms detects, analyzes, and collects capacity and utilization data for both VMFS and NFS datastores. Datastores connected to a provider are automatically created on discovery. On creation of a repository, a datastore is automatically created. After detecting datastores, you might want to examine them more closely to see virtual machines, hosts, and available space. Analyze a datastore to collect information on the types of files on a datastore, and to see the number of managed/registered, managed/unregistered, and unmanaged virtual machines. To perform a SmartState analysis, the datastore is accessible from a running host and valid security credentials are supplied for that host. Be aware that executing a SmartState Analysis on a datastore from the console takes a while to return data on the content. If Capacity and Utilization roles are enabled, Red Hat CloudForms performs the analysis automatically on a scheduled basis approximately every 24 hours. Navigate to Compute → Infrastructure → Datastores. Select the datastores to analyze. You can click on a specific Datastore to view its details. The screen provides you with a Datastore Taskbar, Virtual Thumbnail, Accordion, and Summary. Datastore Taskbar: Choose between Configuration, Policy and Monitoring options for the selected Datastore. Datastore Summary: See summary such as datastore properties, storage, VM information. Datastore PDF: Generates datastore summary in PDF format. Datastore Accordion: See details about Properties, Relationships, Storage Relationships and Content for the chosen datastore. To view Content section details, run a SmartState Analysis on the datastore. For information on how to perform SmartState Analysis, see Performing SmartState Analysis on Datastores. Use tags to categorize a datastore. Click the datastore to tag. Select a customer tag from the first list, and then a value for the tag from the second list. Select more tags as required. You can view capacity and utilization data for a datastore. Red Hat CloudForms requires network visibility to your provider assigned the server role of Capacity & Utilization Collector to enable this feature. Navigate to Compute → Infrastructure → Datastores, then click the Datastore for which to view Capacity and Utilization data. From Interval, select to view hourly or daily data points and the dates to view data. Use VM Types to Include to include only managed/registered, managed/unregistered, or unmanaged virtual machines. Managed/Registered VM - A virtual machine connected to a host and exists in the VMDB. Also, a template connected to a management system and exists in the VMDB. Templates cannot be connected to a host. Managed/Unregistered VM - A virtual machine or template that resides on a repository or is no longer connected to a management system or host and exists in the VMDB. A virtual machine previously considered registered might become unregistered if the virtual machine is removed from management system inventory. Not Managed - Files discovered on a datastore that do not have a virtual machine associated with them in the VMDB. These files might be registered to a management system that Red Hat CloudForms does not have configuration information. Possible causes might be the management system has not been discovered or the management system has been discovered but no security credentials are provided. Use Time Profiles to select a time range for the data. If a datastore no longer contains any files associated with the virtual environment, remove it from the VMDB. This button is enabled only if a datastore is completely empty. Click on the Datastore to remove. Click (Configuration), and then (Remove Datastore from the VMDB). PXE servers are used by Red Hat CloudForms to bootstrap virtual machines for the purpose of provisioning. They include images for different operating systems that can be customized using customization templates and are used in conjunction with IPMI Servers. An availability zone is a provider-specific method of grouping cloud instances and services. Red Hat CloudForms uses Amazon EC2 regions, OpenStack Nova zones, and Google Compute Engine regions as availability zones. You can click on an Availability Zone to view its details. The screen provides you with an Availability Zone Accordion and an Availability Zone Summary page. You can choose between graphical or text view of the datastore summary. Use the Availability Zone Accordion to view the Properties of the zone and its Relationships to other cloud resources. Use the Availability Zone Summary to see details on Relationships (Cloud Provider, Instances) and Smart Management (Company Tags). Use the Availability Zone Accordion’s Relationship section to see items related to an availability zone. Navigate to Compute → Clouds → Availability Zones. Click the availability zone to view the configuration. From the Availability Zone Accordion, click Relationships. Click the type of resource relationship to view as a list. This helps administrators and users organize their OpenStack environment and define limits for different groups of people. For example, one project might require higher quotas and another project might require restricted access to certain ports. OpenStack allows you to define these limits and apply them to a project. Red Hat CloudForms can abstract information from tenants including quotas and relationships to other OpenStack objects. To see multiple tenants in Red Hat CloudForms, the user authenticating to your OpenStack environment from Red Hat CloudForms must be configured to have visibility into these tenants. Click on a specific tenant to view its details. The screen provides you with a Tenant Accordion and a Tenant Summary. Use Tenant Summary Views to change how you are looking at the Summary. Use the Tenant Accordion to view the Properties of the tenant and its Relationships. Use the Tenant Summary to see details on Relationships (Cloud Provider, Security Groups, Instances, and Images), Quotas (including all OpenStack Compute, Network, and Volume quotas) and Smart Management (Company Tags). Use the Tenant Accordion’s Relationship section to see items related to the Tenant. Navigate to Compute → Clouds → Tenants. Click a tenant to view the configuration. From the Tenant Accordion, click Relationships. Click the type of Resource to see the flavor’s relationships. A volume is a block storage device that you can attach to an instance. In the Volumes tab, you can add a new cloud volume, or list all cloud volumes with information including each volume’s Name, Size, Status, Type, if it is Bootable, Availability Zones, and Cloud Provider. Click on a cloud volume to see a summary of the volume. On that screen, you can see which instance is currently using the volume under Relationships, and also see its snapshot. More importantly, you can attach or detach a cloud volume to an instance, and edit or delete a selected volume. Navigate to Compute → Clouds → Volumes. Click (Configuration), then click (Add a new Cloud Volume). In Basic Information, enter Volume Name and Size (in gigabytes) of the volume. In Placement, select the instance you want to attach the volume to from the Cloud Tenant list. Select the cloud volume you want to attach to an instance. Click (Configuration), then click (Attach selected Cloud Volume to an Instance). Specify the instance you want to attach the selected cloud volume to from the Instance list. Specify the Device Mountpoint (optional). Select the cloud volume you want to detach from an instance. Click (Configuration), then click (Detach selected Cloud Volume from an Instance). Select the instance you want to detach the selected volume from, from the Instance list. Select the cloud volume you want to edit. Click (Configuration), then click (Edit selected Cloud Volume). Select the cloud volume you want to delete. Click (Configuration), then click (Delete selected Cloud Volumes). A warning pop-up window appears to confirm the action. Flavors indicate the resource profiles available for instances. Each flavor contains a value set for CPUs, CPU Cores and memory. Flavors allow you to pre-configure resource settings, which you can then apply during instance provisioning. 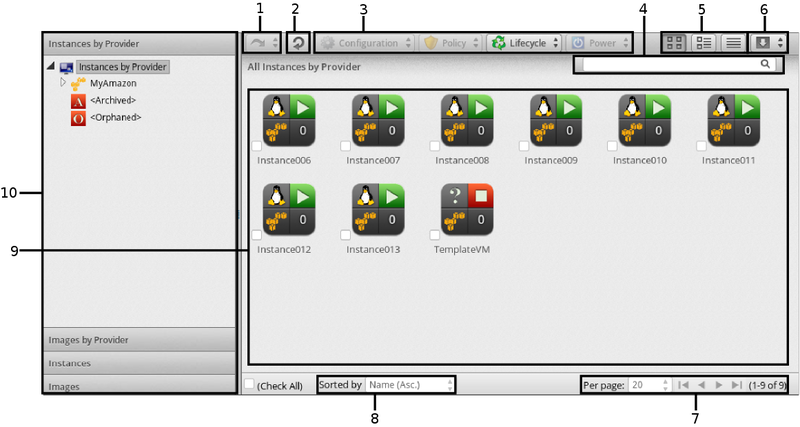 You can also change the flavor of a provisioned instance; see Section 12.18, “Resizing an Instance” for instructions. Red Hat CloudForms provides the ability to view individual flavor information and instances currently using the flavor. You can click on a specific flavor to view its details. The screen provides you with a Flavor Accordion and a Flavor Summary. Use Flavor Summary Views to change how you are looking at the Summary. Use the Flavor Accordion to view the Properties of the flavor and its Relationships. Use the Flavor Summary to see details on Properties (CPUs, CPU Cores, Memory), Relationships (Cloud Provider, Instances), and Smart Management (Company Tags). Use the Flavor Accordion’s Relationship section to see items related to the Flavor. Navigate to Compute → Clouds → Flavors. Click a flavor to view the configuration. From the Flavor Accordion, click Relationships. 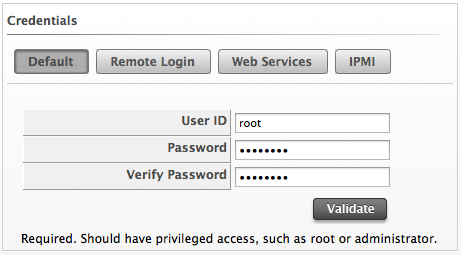 You can group instances using security groups to restrict port or IP address accessibility. Security groups are to be created from the cloud provider side and can be assigned to instances using Red Hat CloudForms instance provisioning. Cloud providers that currently support this function include: Amazon EC2, OpenStack, and Red Hat Enterprise Virtualization. This procedure describes how to view security groups. Navigate to Networks → Security Groups. Click the desired security groups for viewing the details. In Properties, you can view the basic information of the security group. In Relationships, you can view the cloud provider and the instances associated with the security group. In Firewall Rules, you can view a list of ports and IP ranges that are accessible. This box is not available if you have not set any rules for your security group. Apply tags to security groups to categorize them. Select the security group to tag. Select a customer tag to assign from the dropdown menu. Select a value to assign. The Instance container combined with the ability to analyze information inside each instance provides in-depth information across the cloud environment. This rich set of information enables Red Hat CloudForms users to improve problem resolution times and effectively manage instances in their cloud environment. The Instances pages display all instances the server discovered from your cloud providers. The Instances taskbar is a menu driven set of buttons that provide access to functions related to instances. Console uses Virtual Thumbnails to describe instances and images. Each thumbnail contains four quadrants by default. This allows you to glance at an instance for a quick view of its contents. Archived: Instance has no provider or availability zone associated with it. Orphaned: Instance has no availability zone but does have a provider associated with it. On: Instance is powered on. Off: Instance is powered off. Suspended: Instance has been suspended. Use Instances by Provider and Images by Provider to view your instances and images organized by provider. In addition, you can see archived and orphaned items here. Use the Instances to view, apply filters, and collect information about all of your instances. Use Images to view, apply filters, and collect information about all of your images. The Instance Filter accordion is provided so that you can easily navigate through groups of instances. You can use the ones provided or create your own through Advanced Filtering capabilities. Navigate to Compute → Clouds → Instances. Click on the Instances or Images accordion. Go to the Instances or Images accordion. Click All Instances or All Images, then click (Advanced Search) to open the expression editor. Click Count of to create criteria based on the count of something, such as the number of snapshots for an instance, or the number of instances on a host. Type in a name for the search expression in Save this Instance search as. To set the filter to show globally, check Global Search. The filter is saved and shows in the My Filters area of the Filter accordion. If you checked Global Search, the filter shows there. Click the accordion for the items to search (either Instances or Images). Select either a saved instance search or an instance report filter. While you can set the default view for different pages in Configuration → My Settings → Default Views, the current view can also be controlled from the Instances pages. Virtual machines and images can be sorted by Name, Availability Zone, Flavor, Cloud Provider, Compliant, Last Analysis Time, and Region. Click the accordion for the desired items to sort. Click on the Column Name to sort. For example, click on Availability Zone to sort by the name of the availability zone. For a listing of instances and images, you can create a quick report in CSV, TXT, or PDF formats. Click the accordion for the desired items for report creation. To the right of the taskbar on the Instances page, you can enter names or parts of names for searching. You can search in the following ways. Type characters that are included in the name. For example, if you type sp1, all Instances whose names include sp1 appear, such as Windows2003 and Sp1clone. Use * at the end of a term to search for names that begin with specific characters. For example, type v* to find all instances whose names begin with the letter v.
Use \* at the beginning of a term to search for names that end with specific characters. For example, type *sp2 to find all instances whose names end with sp2. Erase all characters from the search box to go back to viewing all instances. Click the accordion for the desired items to search. Analyze an instance to collect metadata such as user accounts, applications, software patches, and other internal information. If Red Hat CloudForms is not set up for automatic analysis, perform a manual analysis of an instance. To perform a SmartState Analysis, Red Hat CloudForms requires a running SmartProxy with visibility to the instance’s storage location so that a snapshot can be created. Check the instances and images to analyze. Click (Configuration), and then (Perform SmartState Analysis) on the taskbar. SmartState Analysis for instances runs as a process independent from providers. For example, a successful SmartState Analysis of a host does not mean SmartState Analysis for instances will be successful. Ensure to enter credentials for the provider that contains the instance for the SmartState Analysis to work. You can compare multiple instances in Red Hat CloudForms server. This allows you to see how different instances are from their original image. This helps detect missing patches, unmanaged user accounts, or unauthorized services. Click the checkboxes for the items to compare. To delete an item from the comparison, click (Remove this VM from the comparison) at the bottom of the items column. To change the base instance that all the others are compared to, click its label at the top of its column. To go to the summary screen for an instance, click its Virtual Thumbnail or icon. Output a the data from a comparison report in TXT, CSV or PDF formats. Refresh your instances to get the latest data the provider can access. This includes information such as the power state, container, and hardware devices attached to the instance. Click the accordion for the desired items to analyze. Click the checkboxes for the items to refresh. Click (Configuration), and then (Refresh Relationships and Power States) on the Instance Taskbar. Red Hat CloudForms can collect processes running on Windows instances. To do this, enter domain credentials for the zone where the instance is located. 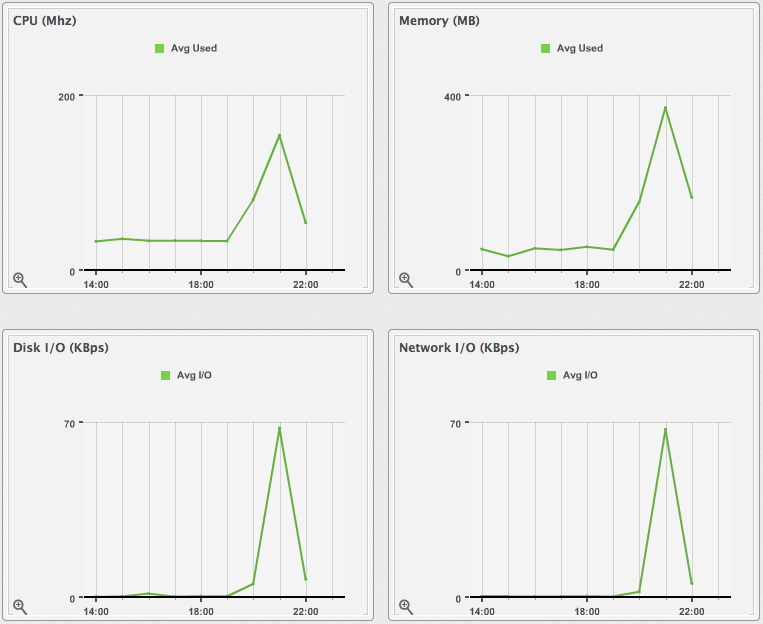 The instance must be running and must have an IP address in the VMDB, usually obtained from a SmartState Analysis. Click the checkboxes for the instances to collect processes. You can set the owner of a group of instances and images by either individual user or group. This allows you an additional way to filter and can be used to enforce quotas. Click the checkboxes for the items to set ownership. Click (Configuration), and then (Set Ownership) on the Instance Taskbar. If an instance has been decommissioned or you need to perform some troubleshooting, you might need to remove a specific instance from the VMDB. This does not however remove the instance or image from its provider. Click the checkboxes for the items to remove. Click the checkboxes for the items to tag. After viewing your list of instances and images, click on a specific item to review a Summary screen of it. The Summary screen provides you with a Virtual Thumbnail and a Taskbar. Use the Taskbar to perform actions on the selected item. Use Summary Views to change the view type of the summary screen. Use Virtual Thumbnails for a quick glance at the item. Use the Summary screen to see a quick summary of the attributes of the item. Click an instance with collected processes. Edit the properties of an instance or image to set parent and child instances. SmartState Analysis also can detect this. From Compute → Clouds → Instances. Click (Configuration), and then (Edit this Instance or Edit this Image) on the Taskbar. From the Parent Instance dropdown, select the parent instance. From Child Instance selection, select instances that are based on the current instance from the list of Available Instances. Follow this procedure to control the power states of an instance through the Red Hat CloudForms console. Click the instance to change the power state. Click Power Operations, then click the button for the desired power operation. Click (Start) to start the selected instances. Click (Terminate) to terminate the selected instances. Click (Suspend) to suspend the selected instances. Click (Reset) to reset the selected instances. Click (Stop Guest) to stop the guest operating system. Click (Restart Guest) to restart the guest operating system. Google Compute Engine instances are limited to the following power options: Start, Stop, and Terminate. Red Hat CloudForms uses collected statistics to recommend the best size for an instance. Red Hat CloudForms uses the information from the Normal Operating Range to calculate the recommendations. Click an instance for right-sizing. Keep in mind that the instance will undergo a controlled shutdown when you change its flavor. For more information about the requirements and underlying OpenStack process involved, see Resize an Instance from the Red Hat OpenStack Platform Instances and Images Guide. Click the instance whose flavor you want to change. Click (Configuration), and then (Reconfigure this Instance). In the Reconfigure Instance section, select the new flavor you want from the Choose Flavor dropdown. Click Submit. Doing so will initiate the flavor change, and it might take several minutes before Red Hat CloudForms verifies whether the change was successful. See Chapter 10, Flavors and Manage Flavors (in the Red Hat OpenStack Platform Instances and Images Guide) for more information. Live migration involves moving a live instance between Compute nodes. Live migration is useful for avoiding instance downtime during cloud maintenance or load management. See How to Migrate a Live Instance (in the Red Hat OpenStack Platform Migrating Instances guide) for details on the underlying OpenStack process. On the right pane, click the instance to be migrated. Use the Instances by Provider accordion to filter instances by provider and/or availability zone. Click (Lifecycle), then (Migrate selected Instance). Auto-select Host? : let the OpenStack provider automatically choose a destination Compute node. If you prefer to choose a specific node, uncheck this option and choose from the Destination Host dropdown. Block Migration: check this option to perform a block-based migration. With this migration, the entire virtual machine image is moved from the source node to the destination node. If your OpenStack provider uses shared storage, leave this option unchecked. See Prerequisites (in the Red Hat OpenStack Platform Migrating Instances guide) for related information. Disk Over Commit: check this option to prevent the OpenStack provider from verifying first whether the destination host has available disk space to host the instance. Once the migration initiates, the instance list will reload with a message indicating that the selected instance is being migrated. Upon completion, the instance list will reload and the evacuated instance will be displayed as (On). If a Compute node is shut down, you can evacuate instances hosted on it. This is only useful if the instances use shared storage or Block Storage volumes. See Evacuate Instances (in the Red Hat OpenStack Platform Instances and Images Guide) for details on the underlying OpenStack process. On the right pane, click the instance to be evacuated. Use the Instances by Provider accordion to filter instances by provider and/or availability zone. Click (Lifecycle), then (Evacuate selected Instance). On Shared Storage: leave this checked to indicate that all instance files are on shared storage. Once the evacuation initiates, the instance list will reload with a message indicating that the selected instance is being evacuated. Upon completion, the instance list will reload and the evacuated instance will be displayed as (On). View capacity and utilization data for instances that are part of a cluster. You must have a server with network visibility to your provider assigned the server role of Capacity & Utilization Collector to use this feature. For more information, see General Configuration. Click the accordion to view capacity data. Click the item to view. Click (Monitoring), and then (Utilization) on the taskbar. Select to view hourly, most recent hour, or daily data points for the dates to view data. View the timeline of events for an instance or image if registered to a host. Click the instance to view the timeline. When you click on a specific instance or image, you will see the Virtual Thumbnail, and an operating system-specific summary screen of the item. Where applicable, click on a subcategory of the summary to see more detail on that section. Properties include information such as the base operating system, hostname, IP addresses, instance vendor, cloud resources, and snapshots. This includes the ability to analyze multiple partitions, multiple disks, Linux logical volumes, extended partitions, and Windows drives. Some categories can be clicked on for additional detail. For example, click Container to view notes associated with an instance. Relationships include information on the instance’s cloud provider, genealogy such as parent and child instances, and drift. Compliance shows the status of system compliance checks and history of past checks. Power Management displays the current power state, last boot time, and last power state change. State Changed On is the date that the instance last changed its power state. This is a container view of the power state, therefore a restart of the operating system does not cause the container power state to change and does not update this value. Security includes information on users and groups. Configuration includes information on applications, services, packages, init processes, and files. This section changes depending on the base operating system. Smart Management shows all tags assigned to this instance. Performing a SmartState Analysis on an instance or image provides more detailed information in these categories. Red Hat CloudForms’s SmartState Analysis feature returns user information. Explore the user to get details on the user’s account, including group memberships. From the Security section of the Instance Summary, click Users. Red Hat CloudForms’s SmartState Analysis feature returns group information. Explore the group to get a list of its users. From the Security section of the Instance Summary, click Groups. Red Hat CloudForms detects the lineage of an instance. View an instance’s lineage and compare the instances that are part of its tree. This also allows tagging of instances that share genealogy. Review the configuration changes that happen to a particular instance between multiple points in time. Review the association changes that happen to a particular instance between multiple points in time. Review the classification changes that happen to an instance between two time checks. Capture the configuration drifts for a single instance across a time period. Click the accordion for the item to view drift. Click the checkboxes for the analyses to compare. Click (Select up to 10 timestamps for Drift Analysis)] at the top of the screen. The results display. Each time a SmartState Analysis is performed on an instance, a record is created of the task. This information is accessed either from the Instance Accordion or the Instance Summary. Use this detail to find when the last analysis was completed and if it completed successfully. If the analysis resulted in an error, the error is shown here. Click the accordion for the desired item to view analysis history. Using an Analysis Profile, collect event log information from your instances. See Setting a Default Analysis Profile in General Configuration. Navigate to Compute → Clouds → Stacks to see a list of orchestration stacks along with information such as Name, Provider, Type, Status, Instances, Security Groups, and Cloud Networks. Click on a stack to see more information about it, including properties, retirement date, and relationships with the cloud provider and instances. You can click on instances to see details of all instances the stack relates to. Apply tags to orchestration stacks to categorize them together at the same time. . Navigate to Compute → Clouds → Stacks. . Select the orchestration stacks to tag. . Click (Policy), and then (Edit Tags). . Select a customer tag to assign from the first list. . Select a value to assign from the second list. . Click Save. You can either retire orchestration stacks on a set date, or retire them immediately. Navigate to Compute → Clouds → Stacks. Select the orchestration stacks to retire on a set date. Click (Lifecycle), and then (Set Retirement Dates). On the Retire Orchestration Stacks page, set Retirement Date. Select Retirement Warning from the list. The default is None. Saving a blank date will remove all retirement dates. Select the orchestration stacks to retire now. Click (Lifecycle), and then (Retire selected Stacks). A pop-up window appears to confirm the action. Select the orchestration stacks to remove from the VMDB. A warning pop-up window appears to confirm the action. Click (Configuration), and then (Remove Stacks from the VMDB). This tab lists key pairs and fingerprints for all cloud providers. Click on a key pair to see a summary and its relationship with instances. On this screen, click on instances to see details of all instances the key pair relates to. You can use the key pairs added during provisioning instances. Adding a new key pair is currently only supported for OpenStack. Navigate to Compute → Clouds → Key Pairs. Click (Configuration), then click (Add a new Key Pair). In Basic Information, enter a Name and the Public Key (optional) generated using ssh-keygen command. Select your OpenStack provider from the Provider list. Select the key pair you want to remove from the key pairs list. Or, click on the key pair to see the instances it relates to. Click (Configuration), then click (Remove selected Key Pairs). A warning appears to confirm the action. Navigate to Compute → Clouds → Object Stores to see a list of all cloud object stores along with information including Key, Size (bytes), Object Count, Cloud Tenant, and Cloud Provider. Click on an object store to see its properties and relationships with the cloud provider, tenant, and object store on the summary page. Apply tags to object stores to categorize them together at the same time. Navigate to Compute → Clouds → Object Stores. Select the object stores to tag. Select a customer tag to assign from the first list. Select a value to assign from the second list.